It’s that time of year again, soup time! Today Mexico meets Italy for this quick meal that’s packed full of nutrients and flavour. This Mexican Tomato Cauliflower Meatball Soup is a winner every time even the kids will love it. The soup that eats like a meal…this is it! After a summer of picking tonnes of organic tomatoes then freezing them we have plenty to use up this winter for soups and sauces. This hearty soup can be made in 30 minutes and pairs well with homemade bread or a thick homemade slice of low-carb bread and butter. You don’t need anything else. If you’re not into low-carb don’t fret there is nothing fancy or different about this soup it’s just low-carb friendly. That means there’s no sugar or gluten in the recipe with limited carbs but so delicious even I can’t stop at one bowl. The low-carb part helps those on a low-carb diet identify recipes that are keto-friendly which is a bonus when searching for a recipe. You will see below the options for those who are low-carb and for those who are not. To be honest there’s not much of a difference at all. This Mexican tomato cauliflower meatball soup is all about the prep work and the rest will fall into place nice and easy. The best meatball soup is happening right here and you’re not going to believe how simple it is. When we make our Mexican tomato cauliflower meatball soup we use our Low-carb meatballs recipe in Nonna’s pasta sauce which we freeze. When you make the low-carb meatballs fry the meatballs lightly on all sides just until they are browned but not fully cooked as they will finish cooking in the soup. You can also make a fresh batch of Nonna’s basic Italian meatballs (not keto-friendly see notes in recipe below) and bake them fully or until almost done in the oven then add them to your tomato cauliflower meatball soup. Keep in mind that if you don’t have the meatball prep-work done that the soup will take longer to make. I’ve added an hour of prep work to the recipe for this reason. It may take you a bit longer depending on how fast you work. My suggestion is to have a batch of meatballs in the freezer whether raw or fully cooked in sauce. This makes it easier when you want to whip a quick meal because you eliminate the time-consuming part of the recipe, the meatballs. 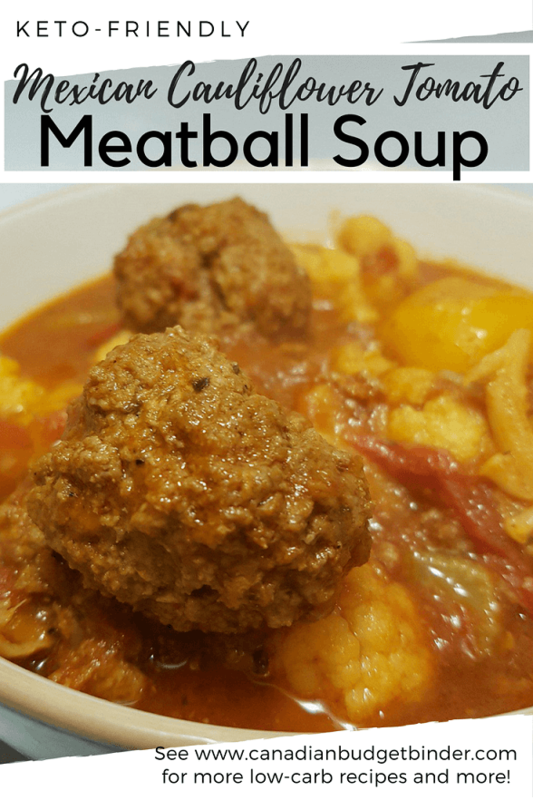 You can make this meatball soup with frozen meatballs but it won’t taste as good as making homemade Italian meatballs. As you will notice when we make our low-carb Italian meatballs we lightly brown them before going into the sauce. You can do that if you plan to make the sauce with these meatballs. If not almost fully cook them then add to the soup at the end during the last 15 minutes of cooking so they cook through. If you want to use the authentic Nonna’s Italian meatballs and sauce you can do that as well. The sauce you can freeze for another meal. Keep in mind these meatballs are not gluten-free or low-carb friendly as they contain breadcrumbs. The meatballs will fully cook from raw in the sauce. You are going to want the meatballs to be fully cooked if using Nonna’s meatball recipe which cuts down on the cooking time especially if you’re in a rush during the week. Make the sauce and meatballs ahead of time. We know what it’s like to try and swallow food and rush out the door for soccer practice. A complete nightmare especially if everyone is hungry and grumpy. Typically those nights are pizza night in our family but we don’t always want pizza every week. It’s nice to come home to a hot pot of soup ready to be warmed and served. You could easily do this in a crock-pot and add the cooked meatballs near the end of the cooking process or raw if you plan to have the soup cook on low for 6 hours on high. The only problem when using raw meatballs for soup is that you will get more of the grease which I don’t care for in my soup. It’s a different story when you’re making pasta sauce though. Alternatively you can use lean beef or your choice of mince to cut down on the amount of fat and grease and go raw in the crock-pot. The choice is yours. When you’re on the keto-diet good fats are your best friend. Ideally you can make a big pot of this tomato cauliflower meatball soup on a Sunday when most people do meal prep and it will be ready for a few meals. Whether you bring it to work for lunch or enjoy the soup at home the best part is that all you need to do is heat it up. You don’t have to buy organic vegetables for this soup but you will taste a distinct difference in the flavour. Most often our grocery budget can’t afford organic unless it’s on the reduced rack or from the in-laws summer garden.For this recipe we had a large white cauliflower that we washed and chopped into chunky pieces, enough for a mouthful. If you have the time to make a batch of homemade chicken broth or have some in the freezer you can use it for this recipe. We don’t. In this house most often we are using chicken or beef bouillon cubes unless we get a chance to make a nice bone broth which only happens a couple of times a year. Loaded with flavours from our homemade taco seasoning and half a white onion you’ll see where the Mexican flavours meet the Italian basil, oregano and garlic in the meatballs. Let’s get cooking… enough talk. 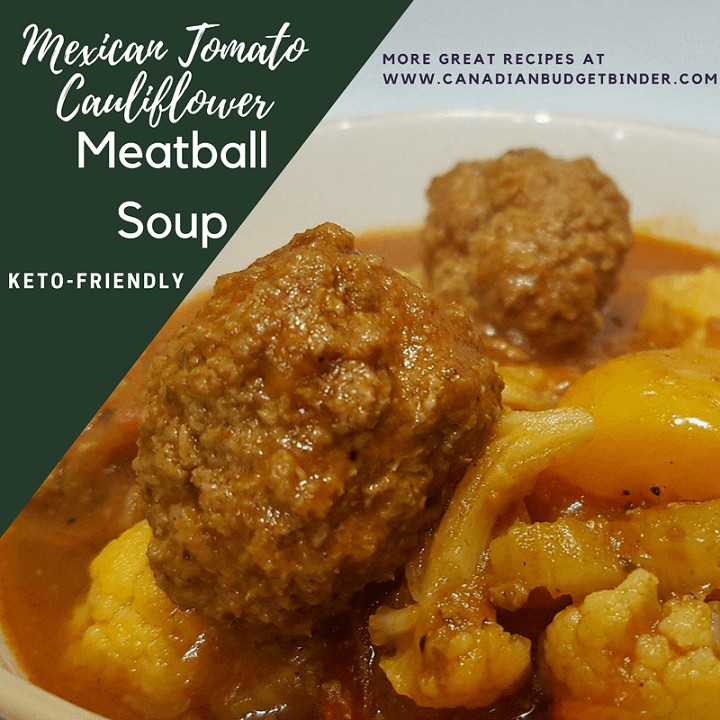 If you love Mexican and Italian food you're going to love how easy and delicious this hearty Mexican Tomato Cauliflower Meatball Soup is. 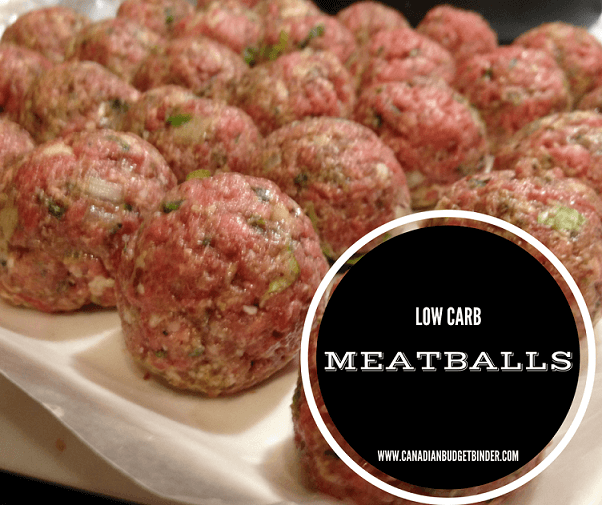 Low-Carb Meatballs - See recipe link in post above very easy to make ahead of time in the crock-pot or Nonna's meatballs in Italian tomato sauce. recipe link above just eliminate the carrots, wine and sugar to keep it low-carb and use low-carb meatball recipe instead. Fill a large pot with the cold water and add the cauliflower cover and bring to a boil on high then reduce to medium-low for 5-7 minutes until fork tender.Drain. Add 2 cans of diced tomatoes 8 medium tomatoes), strained tomatoes, salt, pepper, taco seasoning and stir to combine well. Gently add your meatballs into the pot. I like to add about 15 almost fully cooked meatballs if I can depending on how many I made from the meatball recipe. Let the soup cook down for 15-20 minutes for the meatballs to fully cook then gently add the cauliflower back in and serve hot. Optional : Sometimes I like to add a couple of tablespoons of Franks Red Hot Sauce as well. Cut recipe in half if you want or freeze leftovers for up to 4 months in containers so the meatballs don't break. You will have the sauce left to freeze once you use the meatballs for the soup. This way you have sauce ready for your next meal. Below are the recipes you will need for this easy soup all in one spot or you can find them throughout this post above. Don’t be discouraged as I’ve already made parts of this soup in other recipes which is why I have the links for you. There was no point in me typing out the entire recipes again. Pasta Sauce (eliminate carrots, wine and sugar for a low-carb sauce) You won’t actually be using the sauce for this recipe but it’s a great way to save time by making the meatballs and sauce and using the meatballs for the soup and freezing the sauce for another time. Per 1 cup of soup and meatballs: = 4.28 Net Carbs using low-carb meatballs, plus soup recipe. Used Atkins Carb Counter.